Wholesale ammonites sold by the flat, box or weight. 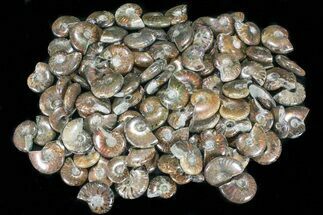 Excellent pricing on authentic fossil ammonites, both rough and polished in quantity. Please contact us if you have specific requests including different sizes, quantities and qualities. We have over 5,000 square feet of warehouse space full of fossils not currently listed on the website. Ammonites were extinct cephalopods that resembled a squid with a shell. They are more closely related to a living octopus, though the shells resemble that of a nautilus. Ammonites appeared in the fossil record about 240 million years ago and went extinct 65 million years ago. There fossils are found abundantly in rocks throughout the world.